Wild salmon eat fish and shrimps, but soon the first salmon grown with larvae of black soldier flies will lay on your plate. The flies are the workhorses of the Turnhout company Millibeter, who grows larvae with residual streams such as potato peels and beet pulp. The black soldier fly plays an important role in the shift to a more sustainable fishing industry. 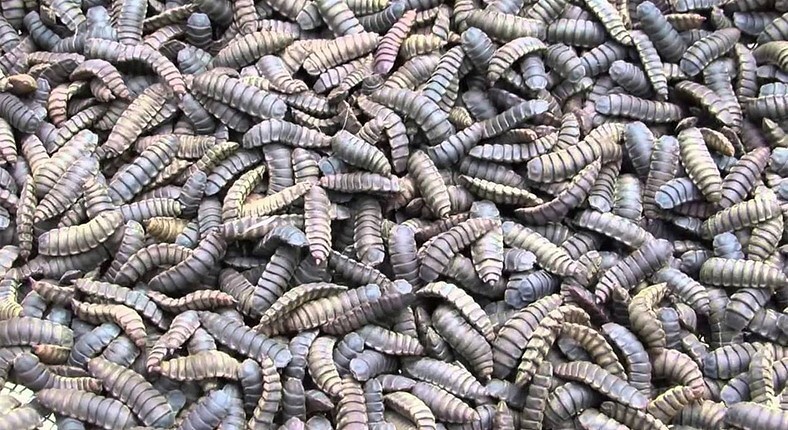 The insects serve as an alternative to fish meal and soybean meal with which fish such as salmon, trout and Pike-perch in aquaculture are grown. "Ecologically it is already, now economically it has to be more attractive", says Johan Jacobs, founder of Millibeter. Last year, about 160 million tonnes of fish is produced worldwide, of which half is produced in aquaculture- in ponds, in tanks on land or at sea in cages. For years the global fish consumption rises and now exceeds the 20 kilograms per head, of which Belgium is in the middle bracket. "The expectation is that by 2030 about 75 to 100 million tons additional will be consumed", says Johan Verreth, aquaculture specialist at the Dutch University of Wageningen. "The extra tons of fish that is needed in the coming years, we will not from the oceans. That has already reached their limit. The aquaculture industry is facing a huge challenge to fill that gap. “In a responsible way, because like any form of intensive cultivation, the fish farming knows its problems", says Helen. One of those problems is the search for new food ingredients. Now fish that are mainly grown in aquaculture eat fish meal, a mixture of ground sardines, anchovies and mackerel which are caught massively for the coasts of Peru and Chile. "You notice right away that that is not the ideal way to grow fish. This food source is not inexhaustible", said Erik-Jan Lock, a Dutch researcher who was involved in one of the first insects projects in the Norwegian salmon industry. There is a need for an alternative food source for the fish. "The larvae of the black soldiers fly come compositionally near fish meal. We have done extensive testing and have grown salmon with it from 1 to 4 kilograms. There was no difference. They grew quickly and the quality of the salmon fillets had to be the same", says Lock. The larvae, however, came not from the Belgian Millibeter, but of the Dutch Protix. While the search for extra millions for the expansion of Millibeter is not going easy, Protix brought in 45 million euro of fresh capital last year to set up a large insects farm. Investors of neighbouring country France pumped EUR 15 million in the sector colleague Innovafeed. If all goes well, the first French ‘insects trout’ will be sold at the supermarket ‘Auchan’ this summer. Our neighbouring countries invest in insects, in Belgium it is more difficult. "The question now is not what can, but what may", explains Ian Calvert, insect expert at the Research Institute Inagro in West Flanders. As raw material for animal feed for now the door remains locked, and only since last year the fishing industry can use insect species in the fish feed. "It's a step in the right direction and there is a lot of moving going on," says Cameron. "The question is how much time is needed to break this on a large scale." The price will play a crucial role in this. Salmon, or any fish that is fed with insects, will appear slowly at the fish stall. "You have to start somewhere. And look around you. If you look at all organic residual streams in the world, you can make more insect meals than actually needed", says researcher Lock full of conviction. Can we call salmon, grown on plants and insects, still call salmon?" It makes no difference molecular if a salmon gets its amino acids from fish, soy or insect. The muscle building makes no distinction. Of course it is salmon", concludes aquaculture specialist Verreth.